I noticed that BGO was running so I quickly sent in some requests. 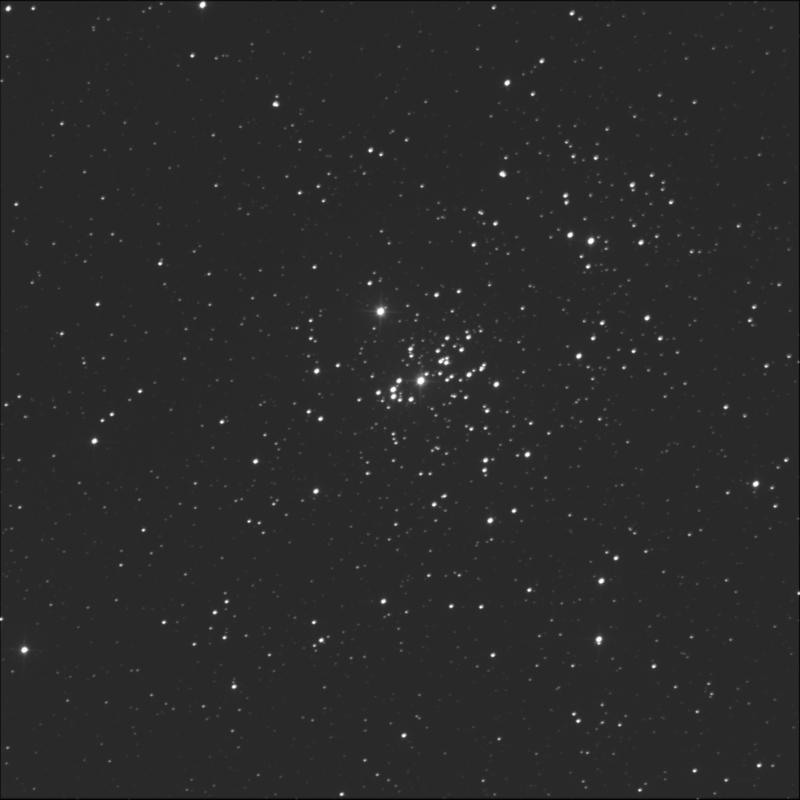 The 'bot was able to partly image NGC 869 aka h Persei for me. 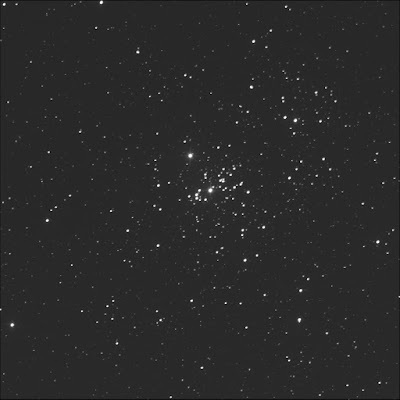 One half of the Double Cluster (and Caldwell 14) which is one of the RASC Finest NGCs. The imaging run stopped short of collecting blue data so I'll have to have another go. Luminance only, 60 seconds subexposures, 10 stacked shots. FITS Liberator, GIMP. North is up; left is east. The bright star dead centre is V520 Per. It is a simple pair, also known as HJ 1114. The dimmer B star is easily spotted up and right or to the north-west. ST3 says it is 20" away. My image shows is closer. The Washington Double Star Catalog says, as of 2013, the separation is 16.4". This matches more closely my photo. Perhaps the gravitational effects in open clusters are significant and the members get pushed and pulled in all different ways. Near the top of the image, slightly left, is the triple system WZ 4. The B star is visible as a bump on the west edge of A, touching. ST3P states the separation is 3.6". C is away, to the north. At the 1 o'clock position from centre, not quite as far away, is SAO 23172 aka TDS 81. ST3P says the separation is 1.2". But I see a pattern like WZ 4. The WDS shows two pairs actually! The AB sep is 1.2". But the AC pair aka BKO 168 (not listed in ST3) shows a sep of 4.3 as of 2015. Ah ha! I've caught the C star. The bright star with close partner to the bottom right is HD 14053. South-west of centre. Three or so magnitudes different. The wide dim pair south of HD is STI 1842. Curiously, the A star is the dimmer one. Imaged again on 25 August.